Recipe for simple vegan Gnocchi made from scratch. You’ll only need 3 ingredients and they’re really easy to make. And they even taste better than the store-bought ones! I can’t believe making vegan gnocchi from scratch is that easy!! I don’t even know what took me so long. 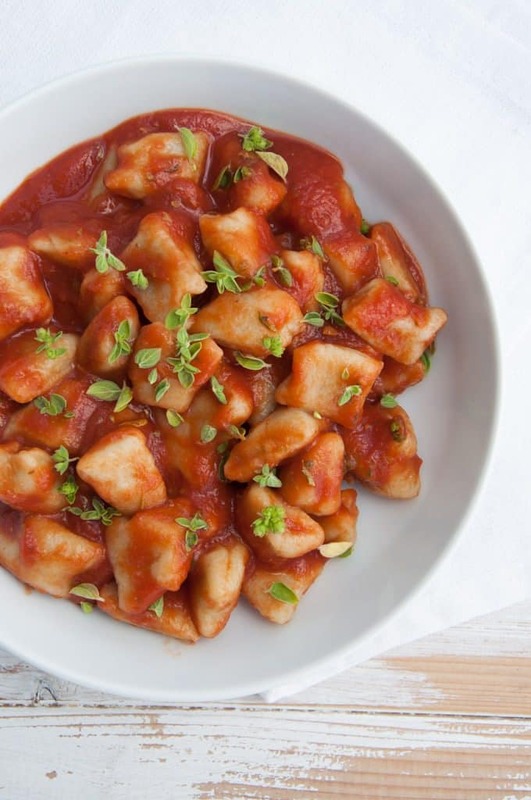 I have tried making vegan gnocchi years ago, but they didn’t turn out as I expected (they fell apart while cooking them). I think I have either used the wrong potatoes and or have not added enough flour. At that point, I thought eggless gnocchi don’t work. Then I had a long time of not trying them again until I did. I’m so glad! These vegan gnocchi made from scratch turned out perfect, so of course, I have to share the recipe with you. They are fluffy and melt-in-your-mouth gnocchi! And the best part is, you’ll only need 3 ingredients: potatoes, salt, and flour. Does it get any easier than that? I don’t think so. I served the gnocchi with a simple tomato sauce and nutritional yeast because I wanted the gnocchi to be the star of the dish. But there are so many possibilities for sauces! What about gnocchi tossed in a basil pesto or wild garlic pesto? Or a creamy mushroom sauce? Or fried until crispy tossed in olive oil, herbs, and spinach? Mhh! 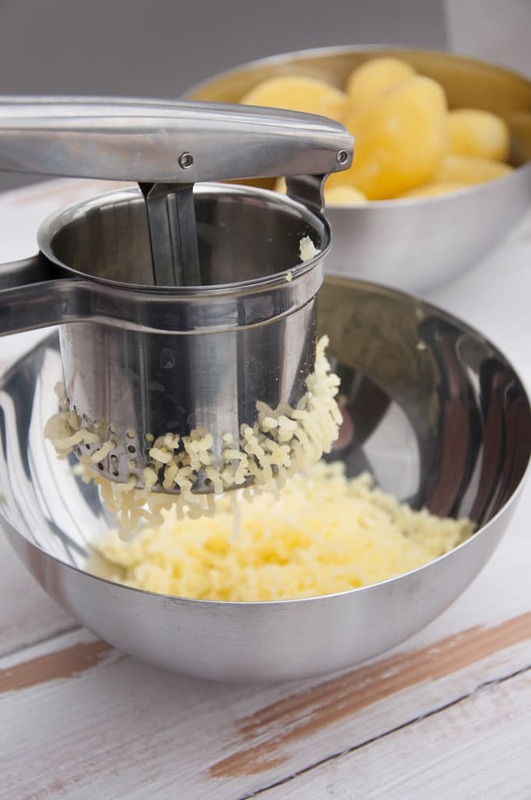 For mashing the potatoes, I’ve used a potato ricer. With that little help, making the potato dough was a matter of 2-3 minutes and the dough was so smooth and soft. The plate left shows the gnocchi fresh out of the boiling water (so fluffy and puffy!). On the right, you see the potato dough. And below are the gnocchi before they’ve hit the water. I simply cut the potato dough rope with a knife. If you want to you can give them the authentic gnocchi-look by rolling them over a fork. But I stuck to the gnocchi-pillow-look! I’d recommend cooking one test gnocchi first, that way you can try out the consistency and adjust the potato dough as needed. If the test gnocchi is too soft, work more flour into the dough. Repeat the step until you’re happy with the consistency and until the gnocchi are fluffy and hold together nicely. Absolutely! After boiling them, drain them, rinse them under cold water, let them cool off, fill them into a ziplock bag or freezer-safe glass container and freeze for up to a couple of months. How to reheat frozen gnocchi? 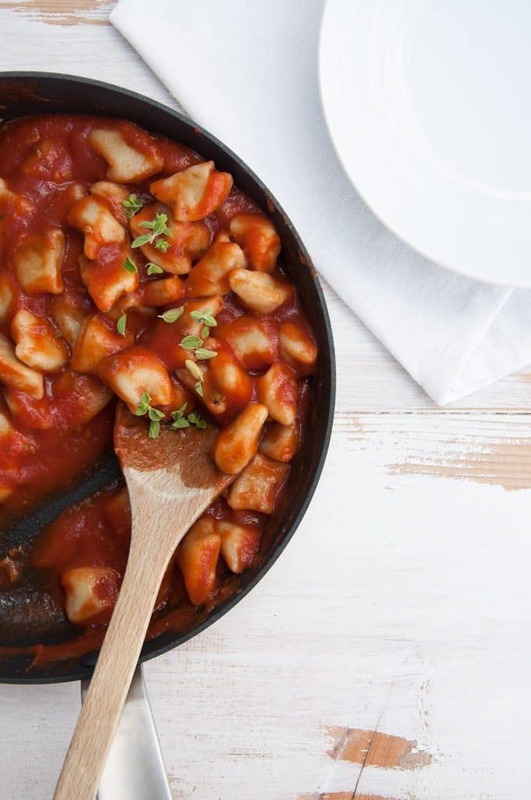 If you want to use your frozen gnocchi, boil them in a pot of water again until they float on top (make sure to try one gnocchi so that they are not frozen in the middle), then pan-fry or add the sauce. They are good as new! I hope you’ll enjoy this gnocchi dish as much as I do! You can always experiment with adding different herbs, spices, and add-ins! Recipe for simple vegan Gnocchi made from scratch. You'll only need 3 ingredients and they're really easy to make. And even taste better than store-bought ones! Peel the potatoes and boil them until they're soft (better overcook than undercook!). Drain the potatoes and let them cool down until cold enough to handle. Then mash the potatoes. I used a potato ricer for that. Add the salt and flour and knead it with your hands until a smooth dough forms. You can add more flour here if you feel like it needs more, otherwise, I'd recommend breaking off a small part of the dough and make a test round. Bring a large pot with water to a boil and add in the test-gnocchi. Let it cook for about 2-3 minutes. Once it swims on the surface, it's ready. Try it. If your test-gnocchi is too mushy and soft, add more flour to the dough and knead again until incorporated. If you're happy with the fluffiness and consistency, you can quarter your potato dough and roll it into a rope on a floured surface. Then cut them into individual pieces. Transfer the gnocchi into the boiling water (work in batches) and let them cook until they swim. Use a skimming spoon to drain them and transfer them to a large saucepan. Repeat for the rest. For the sauce, I simply mixed the tomato puree, salt, pepper, and dried oregano and poured it over the gnocchi in the saucepan and heated it up. I sprinkled fresh oregano and nutritional yeast flakes on top and served it with a leafy green salad. Enjoy! Can you freeze gnocchi? Absolutely! After boiling them, drain them, rinse them under cold water, let them cool off, fill them into a ziplock bag or freezer-safe glass container and freeze for up to a couple of months. 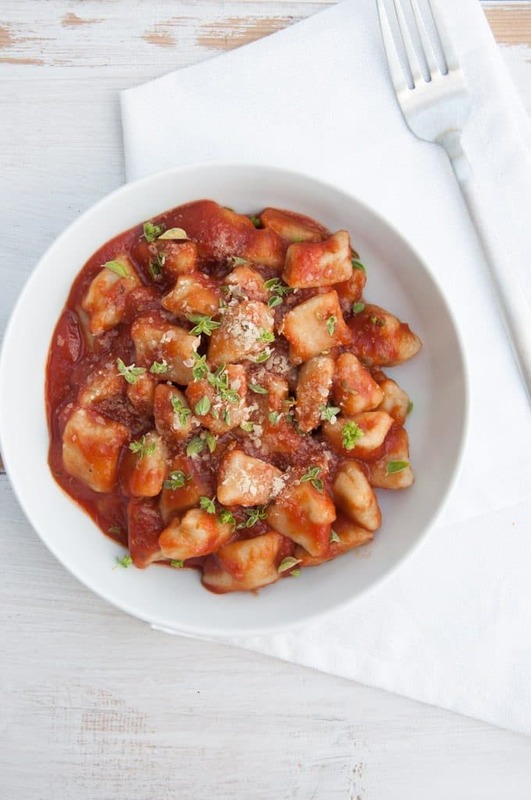 How to reheat frozen gnocchi? 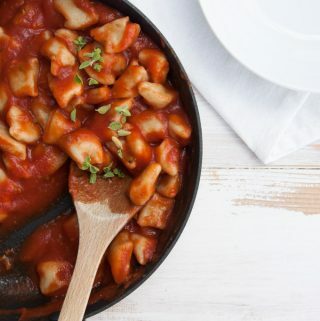 If you want to use your frozen gnocchi, boil them in a pot of water again until they float on top (make sure to try one gnocchi so that they are not frozen in the middle), then pan-fry or add the sauce. They are good as new! Mine completely fell apart in the water. What did I do wrong?? If they fall apart in the water, then the potato-flour ratio was off. My tip is to boil one test gnocchi first, that way you can try out the consistency and adjust the potato dough as needed. 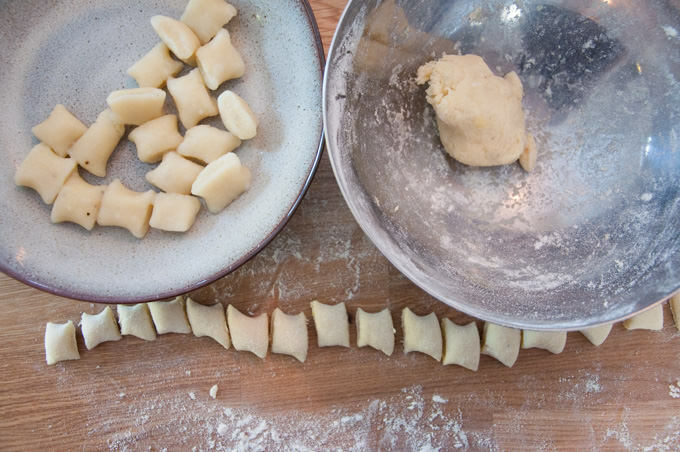 If the test gnocchi is too soft or falls apart, work more flour into the dough. Repeat the step until you’re happy with the consistency and until the gnocchi are fluffy and hold together nicely.